Private equity firms Apollo and TPG did such an effective and over-zealous job of asset stripping after loading up their 2008 acquisition, Caesars Entertainment, with over $18 billion of debt that they’ve been hauled into court by creditors who are charing the two firms with fraudulent conveyance. And yes, sports fans, the operative word is fraud. The underlying idea is that if a company is insolvent, yet the people in charge divert cash or other assets to themselves, they’ve stolen from creditors and need to give the money back. The British, by the way, have a simpler approach to this issue. If a company is “trading insolvent,” as in continuing to operate while broke, the directors are personally liable. Cases based on arguing fraudulent comparatively rare; one of the largest in recent years that involved similar claims, namely fraudulent conveyance and breach of fiduciary duty, was by Mervyns against the consortium of private equity firms that bought it, which included Cerberus and Sun Capital, as well as other parties, was settled in 2012 $166 million. By contrast, a court-appointed examiner last month found that creditor claims against the Apollo and TPG in the Caesars deal are between $3.6 to $5.1 billion before including criminal and common law fraud claims. The report also stated that the Caasers subsidiary that held most of the company’s assets was insolvent mere months after the 2008 acquisition. As you may know, CalPERS is a limited partner in both Apollo Investment Fund VI, a buyout fund sponsored by Apollo Global Management and TPG Partners V, sponsored by TPG Capital. One of the largest buyouts for those funds was Caesars Entertainment, the largest casino company in the world. …For investors like CalPERS Caesars has been deeply disappointing. The market capitalization has lost two-thirds of its value since Apollo and TPG took over in 2008. Last month, Apollo CEO Leon Black acknowledged in Oregon that his film lost its discipline with Caesars by paying too high a price and leveraging too much. But Apollo and TPG recouped their own general partner investments early on. In Apollo’s case, it recovered its own commitment on day one through the transaction fees alone, and TPG recovered its GP investment by 2010. Between transaction and monitoring fees Apollo and TPG have drawn 345 million from Caesars as of the end of 2012. The general partner stands to collect another 150 in monitoring fees over the next five years. That’s on top of limited partner fees. The large transaction monitoring fees clearly create a misalignment of interests between Apollo and TPG as the general partners and limited partners, including CalPERS. While hundreds of millions of dollars have been drained out of Caesars through these fees, the casinos have experienced staffing reductions that negatively impact the guest experience as workers will describe…. We think both workers and limited partners, like CalPERS, would be best served by cash being re-invested in Caesars rather than pulled out as fees. We believe CalPERS should not commit to Apollo’s Fund VIII until TPG and Apollo cease collecting monitoring fees from Caesars. The chairman of the Investment Committee, Henry Jones, gave a perfunctory “thank you” after all of the speakers on Caesars had made their remarks. When the 1,787 page bankruptcy examiner’s report came out last month, a raft of news stories gave short and useful overviews. The Financial Times has done a deeper dive, with one report in the pink paper proper and another in FT Alphaville. Wheeling and dealing at Caesars since the leveraged buyout has raised eyebrows for years. “The Caesars case is a brilliant and unprecedented example of creative liability management that is testing the limits of the market,” says Sarah Gefter, senior analyst at Reorg Research. Caesars went much further than standard capital market maneuvers, engaging in a series of complex sales of casinos and intellectual property as well as financings, allegedly to benefit its private equity owners Apollo Global and TPG to the detriment of creditors. These gambits included setting up an entirely new public company called Caesars Acquisition Corporation to buy several Caesars properties and the infamous release of a debt guarantee possibly enabled by a perhaps poorly-worded indenture. Those transfers bothered creditors enough that they filed multiple lawsuits in 2014 and 2015 against various Caesars entities accusing the parent company, Caesars Entertainment Corporation (CEC) and its private equity owners of “looting” the subsidiary company where the assets and the debt were situated, Caesars Entertainment Operating Company (CEOC). The big question underlying all the claims of fraudulent transfers and breaches of duty is whether CEOC, the subsidiary of CEC, was solvent, or not. A section in the court examiner’s Caesars report is dedicated to the role of Paul, Weiss in most of the disputed transactions. Under corporate law, insolvency at the Caesars operating company should have led to the appointment of independent directors, lawyers and bankers to protect creditors…. It then repeatedly represented both the parent and subsidiary Caesars entities despite their diverging interests. Even though the conflict was glaring, it’s widespread if not pervasive in high end law practice for law firms to ask for and get waivers from their clients. Why this is perceived as sound is beyond me. Moreover, precisely because of CEOC’s very problematic financial condition, by sometime in late 2012 the Sponsors adopted and began to implement a strategy, which while providing some benefit to CEOC, was designed, among other things, to strengthen CEC’s and the Sponsors’ position in a potential restructuring negotiation with creditors and improve their position in the event of a CEC or CEOC bankruptcy. Indeed, by the Fall of 2013, while hoping to avoid a CEOC bankruptcy, the Sponsors began planning for what would happen in the event of such a bankruptcy. Apollo and TPG tried making the only defense they could, which was that this valuation was just the examiner’s opinion. 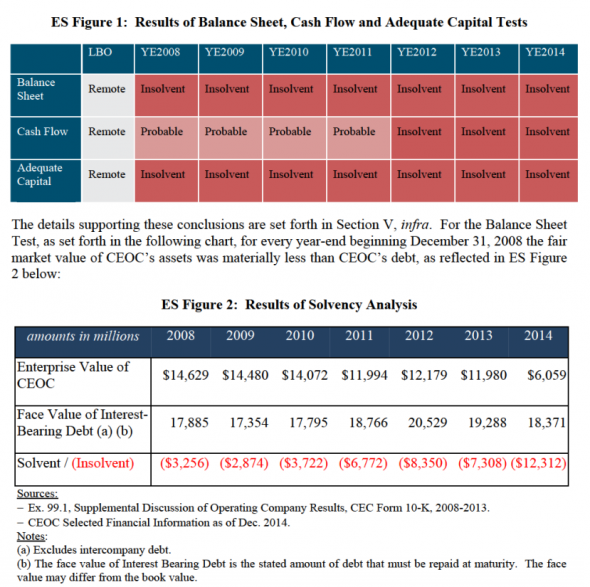 They try arguing that they considered Caesars to be solvent because they had given it “financial runway” by lengthening debt maturities and that Caesars was still paying its creditors. The report stresses that this is not the legal definition of solvency, and that the board of the subsidiary can’t pretend not to know, since they were briefed in early 2009 on what the standards were and the mounting signs of insolvency. The billionaire PE guys on the board each offered self-serving views on what defined insolvency (and plenty of evidence is cited showing they had, at least, contemplated insolvency at CEOC) but here we will share only this gem from the CEO of CEC, Gary Loveman, the marketing whiz with a PhD from MIT and a former Harvard Business School professor. Gary Loveman, CEO and Chairman of the Board of CEC and CEOC, thought both that the issue was what alternatives were available to address the Company’s problem in the future while it met its current obligations, and that in calculating solvency you looked at the market value, not the face value, of the debt. This was so laughable, that the examiner could not help but respond in a footnote. If this was true, the worse the financial condition of a company, the less likely it would be insolvent since such a company’s debt would be trading at an ever increasing discount. Mr. Loveman was plainly wrong. I wish I had time to read the report in full, since FT Alphaville stresses, “…just reading the lengths private equity firms will go to salvage bad investments is mind-blowing.” Well, but as we can see, “salvage” does not mean save the business, but maximize their take. This is going to be quite the court drama. Stay tuned. This entry was posted in Banking industry, Credit markets, Legal, Private equity, Ridiculously obvious scams on April 12, 2016 by Yves Smith. Thanks for highlighting this story Yves. I seem to recall reading about this private equity rip off on the site before. I also was unaware about law firms engaging in such blatant conflict of interest schemes. I suppose it’s the same as it ever was in that ethics and laws don’t apply to those at the peak of the mountain. (or should be) a continuing source of embarrassment. What kind of values do these people bring to an educational or non-profit setting? The values of a predatory horde….. It matters to all us ordinary people, of course. How much did Mitt Romney scam off this one? ——> Advisory Council of Imperialists? Why, just last week we had the brilliance of “mortgages for medicine” pop up from Haarvaaaard and MIT, so I would say the values are in the shitter. The course is called Corruption 101, and Larry Summers is the professor. don’t forget the conflict-of-interest of black managing dartmouth’s money while serving on its board. It’s not fraud if the current system allows for that and that’s what we have here. Many speculated that this company was insolvent on day one and was taken private for the purposes of looting. The mob, who founded legalized gambling, understood this ridiculous contradiction and skimmed the profits while maintaining a going concern. Now it’s done “legally,” but the company is sacrificed along with its investors and employees. If I knew that this deal was crazy how did it happen that Calpers didn’t? Hookers and blow come to mind. Hookers & Blow, the famous law firm? No, fraudulent conveyance is most assuredly not permitted under the current system. These cases would not have gotten past summary judgment and had a bankruptcy examiner appointed if that were the case. Cerberus and Sun Capital would not have paid $166 million if that were the case. Stop making stuff up. It’s against our written site policies. And CalPERS staff aren’t into hookers and blow. CalPERS has billions to put to work every year. Private equity is mainstream. And they get to hear war stories and go to conferences in places like New York and London. That’s plus the occasional steak dinner is more than enough incentive. Apollyon is Greek for Apollo. “Apollo Global Management” is another way of saying “Satan’s Global Management”. I have a hard time feeling bad about this looting of an organization that is expressly and solely designed to separate people from their money. The house always wins, unless another pirate boards the ship, strips all value, and leaves the hulk for the creditors. There’s some real irony in this story……..
Mr Loveman’s (Mr Lovemoney would be a better name) comment on the value of debt was indeed a howler. He is either an imbecile or a liar. This is the CEO. While those proximately injured by the behavior of Apollo and TPG are the Caesars’ employees and its creditors, let us not forget who will end up holding the bag – the limited partners, including CALPERS. In my view, following the outcome of this case, CALPERS and other LPs should sue the GPs for fraud as well. Let’s put these thieves out of business. And I’ll point out again that it is the California taxpayers who continue to bail out CalPers. This lecture by Oxford professor Ludovic Phalippou on monitoring and transaction fees in PE is quite instructive and includes case studies involving Caesars and Harrahs. Thanks for the ongoing coverage of the PE industry. One. I thought that Tribune was the largest recent case of fraudulent conveyance, but I could be wrong. There certainly was a big and “devastating” examiner report in that case, but not very much came of it and after much haggling the parties hashed out a settlement. Well, three or four versions of it to begin with – which prompted a year plus of additional haggling, if memory serves. Two. Harrah’s (a.k.a. Caesar’s) is probably the most blatant asset transfer case in recent memory, which is why it’s so important. Essentially, the sponsors held equity of a company that both they and everyone else knew was going to have to restructure for many years; while they took advantage of the capital markets (thank you, Fed!) to run out the string, they busied themselves setting up a “good bank-bad bank” scheme where the original Harrah’s ended up with all of the to-be-restructured debt while affiliates (that the sponsors had equity stakes in) ended up with most of the good assets. So either you’re allowed to do this, or you are not. If you are, then bankruptcy laws become pretty much meaningless as any sponsor will execute the same maneuver and creditors will end up high and dry time and again. In turn, this probably means vastly more out-of-court negotiations and settlements, and a pretty good PE fund selling point. If you’re not, well, then the sponsors in this case are screwed. Either way, this absolutely has to go to the Appeals Court level before it gets resolved because I don’t see how either side stops fighting. Incidentally, anybody know which circuit this would be under and what their track record is on bankruptcy cases? …all that said. Very interested to see how this ultimately plays out at the Appeals Court level. Is it very bad to hate both? I did not say Mervyn’s was the biggest. I said it was a “one of the largest”. So you start out by straw manning me, a bad faith form of argumentation. Second, saying that Harrah’s was worse is irrelevant. That’s like saying Sandy Hook was worse than San Bernardino and therefore we should not talk about San Bernardino. Puhleeze. Third, you try to blow smoke at my readers by acting as if there aren’t precedents and tests for fraudulent conveyance. Fourth, you act as if I’ve called the case, with your remark, “this will be appealed.” Another straw man. I merely said this case will be a “pass the popcorn” event. Finally, you appear to be unfamiliar with our substantial work on PE. We were writing about private equity abuses in 2012, well before the Bowden speech. And the fee structures, contrary to your assertion, are not the result of political corruption. It’s more complicated than that. It’s due to path dependence (the rich structures became established when PE was doing “bootstrap” deals and they used the fee structures of the then small and offshore hedge fund industry), and weren’t questioned when deal sizes exploded in the 1980s because making money in LBOs then was like shooting fish in barrel, with lots of fat, overly diversified companies trading at conglomerate discounts. The ugly fact is that that public pension funds, oh, and sovereign wealth funds, insurers, private pension funds, endowments and foundations, all invest in PE. How do you explain all the non-public-fund ones? It’s the same underlying factor: they are all cognitively captured and all outmatched by PE as salesmen and negotiators. Only in a very small minority of cases in the public pension world is overt graft at work. Not having any expertise in bankruptcy law this sounds like the iheart media bankruptcy that is sitting in San Antonio Courts. From Bloomberg: IHeartMedia Inc. won more time to try to convince a Texas judge that the company properly shifted shares valued at more than $500 million into a subsidiary beyond some creditors’ reach. Andrew Entwistle, a lawyer representing Gamco Investors Inc., an intervenor in the case on the company’s side, said a temporary restraining order prohibiting debt holders from issuing default notices on the company was extended on Wednesday by agreement among the parties. A trial over the asset shift will be held in San Antonio on May 16. So when is fraudulent conveyance going to be declared on the US govt as well as most state govt’s. Asking people to pay taxes into a bankrupt system seems to be fraud to me! Oh yes monitoring and advisory fees. I remember them well. Reality has become such a satire of itself due to the incompetence of pension funds like Calpers! I’m so old I remember when Caesar’s World was the profitable part of the hotel chain ITT/Sheraton, which owned CW. I worked for CW in the Construction and Capital Projects Department. Then a puny little REIT called “Starwood” came in as a White Knight to buy up Sheraton and CW in the face of a hostile takeover bid from Hilton Hotels. This was way back in the Jurassic 1990s. The Starwood guys had never seen anything like the casino world and I recall quite clearly my boss telling me they wandered around the property with their jaws slack. The margins were way beyond anything a “REIT” had ever seen, either. Recently I saw a headline that Starwood was being bought out by Marriott. How times have changed over such a short period. For those who “can’t find any sympathy” for the jobs lost due to the implosion of a casino operation, many of these jobs (in Vegas, at least) are excellent, middle class Culinary Union jobs which have little to do with the gambling and are part of the hotel/resort operations. And don’t the room cleaners, kitchen staff, and hotel administration folks deserve good jobs with retirement benefits and health insurance at least as much as the greedheads on WS? At least they are providing an actual service, unlike the rentiers, who are even worse than the Mob, since at least the Mob had a long term vision…. I used to go to Vegas somewhat regularly, and it was sad when Caesars/its-parent-company started buying up all the big casinos nearby. IIRC in 2010 Sun Capital put one of its portfolio companies into bankruptcy and bought it out of bankruptcy with another of its arms. I was wondering at the time about the fancy lawyering involved and why it wasn’t just a plain case of fraudulent conveyance. Great summary of PE theft. The game of fraudulent conveyance is becoming a “standard capital market maneuver” for Fund sponsors, whose dishonesty bankrolls the corruption of the legal profession. Thank you for that. Pirate equity = criminal minds. Why do they sign the conflict waivers? Because it’s all about the relationships. They all belong to the same clubs, and those clubs don’t allow…awkwardness…among members.